It’s been a while since we last made a dessert for French Fridays with Dorie. This week’s recipe sounded intriguing based on its name alone. Fortunately, it wasn’t as long or slow in execution as the name implied. 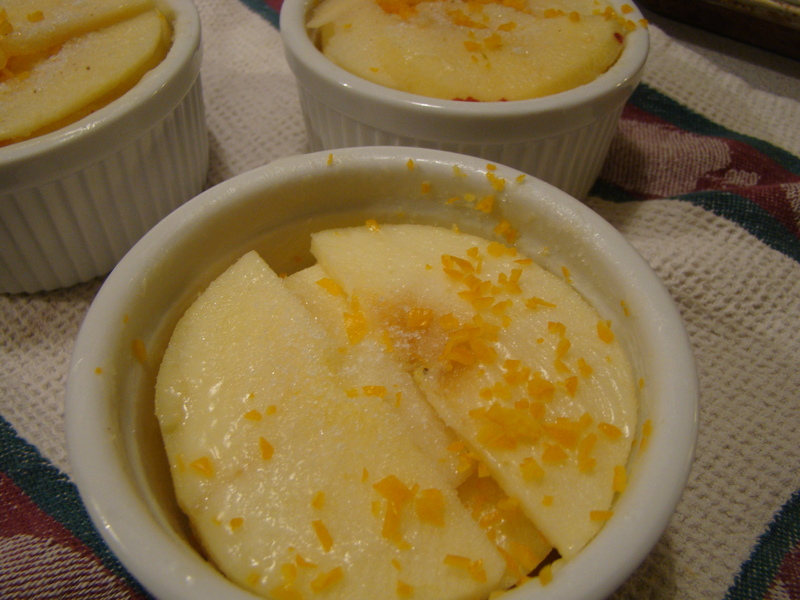 Long and Slow Apples are thinly sliced apples layered into ramekins with butter, spiced sugar, and orange zest sandwiched in between, then baked in a slow oven for a couple of hours. The apples caramelize and tenderize and shrink down to an apple patty just big enough to provide a little sweetness at the end of the meal. 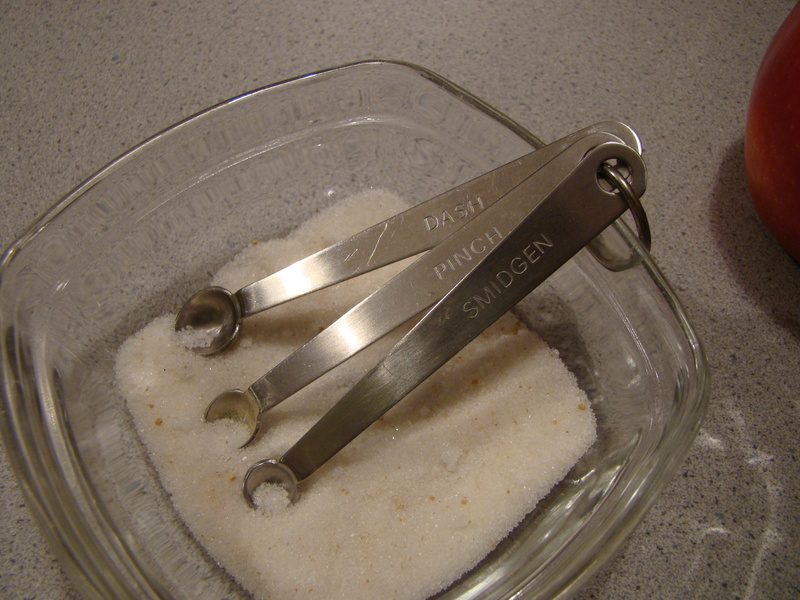 This recipe provided an opportunity to pull out my seldom-used Benringer to slice those apples extra thinly. 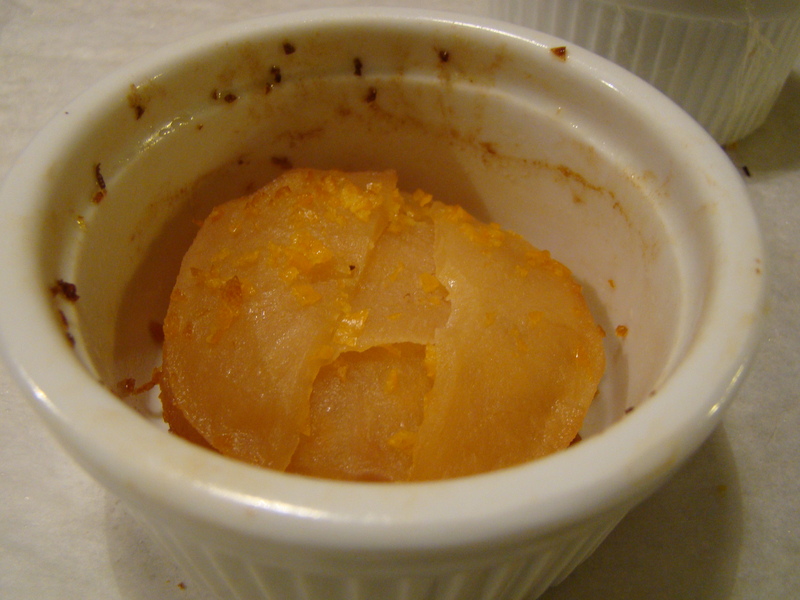 The apple curves fit into the ramekin perfectly, about two or three to a layer. I also got to use my favorite measuring spoons for those tiny units of Dash, Pinch, and Smidgen! I was home alone this week as my husband was spending his week on the warmer West Coast. He isn’t a big fan of fruit desserts anyway, so I halved the recipe. I used two apples, expecting to fill two ramekins, though I filled two to the top and another about two-thirds full. I wasn’t sure whether I should have made added more to the two instead of moving on to another ramekin. Given the shrinkage, maybe I should have. I don’t know. I had my doubts about the next step: wrapping the filled cups with plastic wrap before also wrapping with foil. These were going into the oven after all… Dorie said to trust her, the plastic would not melt. I was very skeptical, but miraculously, she was right. I gather that other Doristas didn’t have the same result and their plastic melted. Others didn’t trust Dorie and used parchment or buttered foil, which is what I’ll do next time. Seems safer. 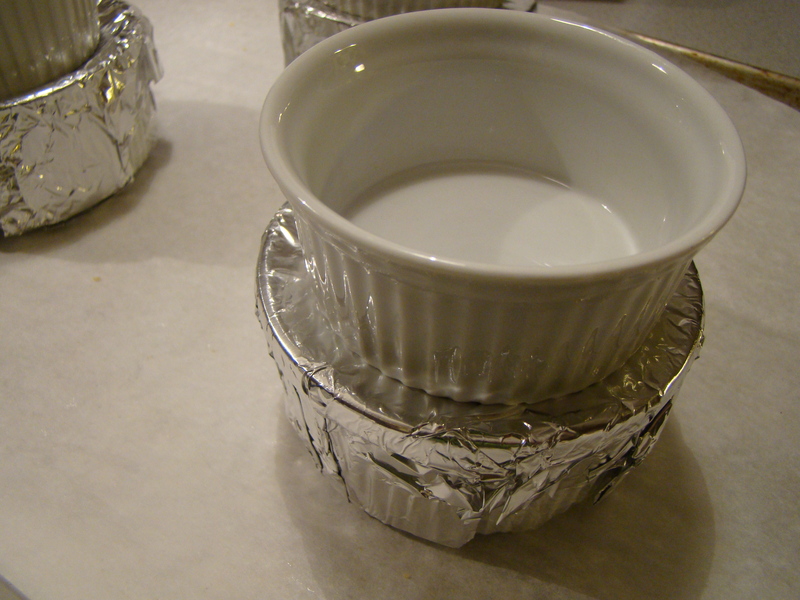 The wrapped cups are lightly weighted down by another ramekin and baked in a slow oven. The house smelled amazing as the apples baked. The combination of apples, which always smell good, and citrus, which also always smells good, made the kitchen smell like home. When they were ready, I couldn’t wait to dig in and try one. I was surprised how much the apples shrank. 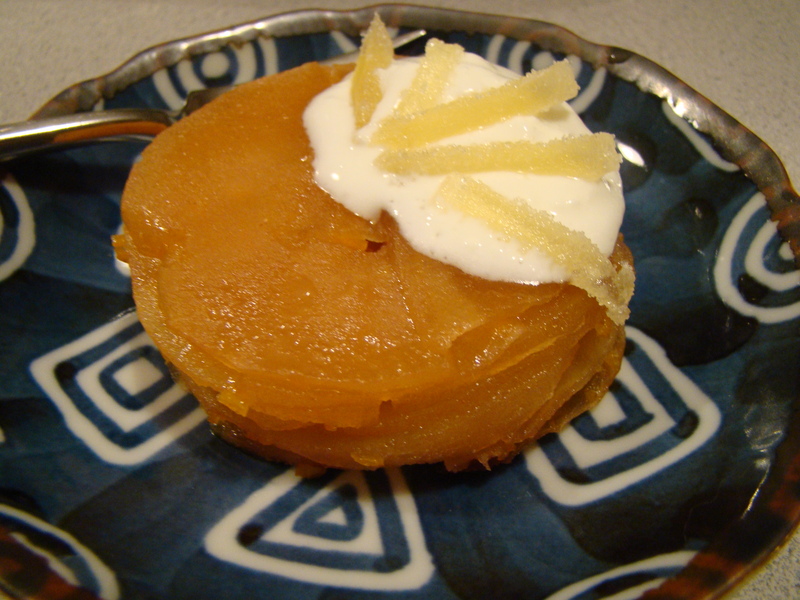 I unmolded the apples onto a plate and, because I’m not one for whipped cream, I dolloped it with Greek yogurt instead, garnishing with some slivered crystallized ginger. I have mixed feelings about these apples. I was too heavy-handed with the orange zest. As I said, the aroma was enticing, but the orange flavor overpowered the apples. The orange zest in the recipe is optional, so I will try again without, or with less. I did like the texture. The apple slices kept their shape and were perfectly tender. This recipe used sugar spiced with dried ginger and coriander. I’d like to play around with other spices as well. Even though butter and sugar are involved, this dessert is relatively healthy as not much of either is used, just enough to boost the natural flavor of the fruit. I will try this again some time, though maybe not right away. If you’d like to try it yourself, the recipe can be found here. If you want to read about other Doristas’ long and slow apples, follow their links here.